The results of a survey done by Consumer Reports suggest that it pays to be cautious and to search for quality and not just price when buying third party cartridges. The article stated that consumers turn to third party cartridges mainly because of lower prices but that they should be cautious because quality can be inconsistent. That’s why shopping at www.inkntoneruk.co.uk pays dividends in both the short and long term. According to Consumer Reports survey, 37 percent of people had bought third party cartridges because they were cheaper and pointed out that OEM cartridges can cost the best part of $700 (€613) (£542) over five years. 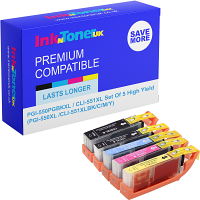 Third party cartridges come as re-manufactured, refilled (not that www.inkntoneruk.co.uk refills!) or compatible and are sold at a lot less than OEM printer inks. The article noted that the outcome of the Lexmark v. Impressions case where the judge ruled that third party businesses could refill and reuse toner cartridges originally made by Lexmark or any other OEM meant that smaller businesses now had more freedom from the restriction of patents. Even so, the article warns that these products have their set backs and do not always operate as well as the originals and that some can void the printers guarantee. Consumer Reports survey said 63 percent found that third party cartridges were just as good as OEMs while 36 said they were not as good. Consumer Reports testers found inconsistencies with third party cartridges and Rich Sulin, Leader of Printer Testing Programme said that some samples worked without problems while others set off “warning messages from their printer or failed to print a test page” while others clogged printer heads. Sulin and www.inkntoneruk.co.uk advises customers to use cartridges as soon as possible after purchase to test them out and to make sure there is a money back guarantee, which of course there is with us! The article reiterated the OEM warranty warning about using non-OEM cartridges and said as an example Lexmark states “that its warranty does not cover failures from “refilling or remanufacture by a third party of products, supplies or parts.” Consumer Reports also warned that smart printers could tell which cartridges were being used and could alert the manufacturer. Consumer Reports suggested buying supertank printers to save money on ink or using an ink subscription service which according to HP Inc could cut costs in half. We are of course highly sceptical of this report’s conclusion because our mission is to provide quality whilst saving our customers money and we are certain that our many long standing customers would agree!